If you’re going to learn one thing about cooking from me, let it be this. Roasting vegetables brings out the best of their flavors. It intensifies their best notes, makes the vegetables sweeter and more flavorful. Take this soup for example. Carrot ginger soup is delicious. I’ve made it and enjoyed it many times in the past. But the other day, in the grocery store, I suddenly thought of roasting the combination. I knew I would make a soup ten times better than the unroasted kind. And I was totally right. 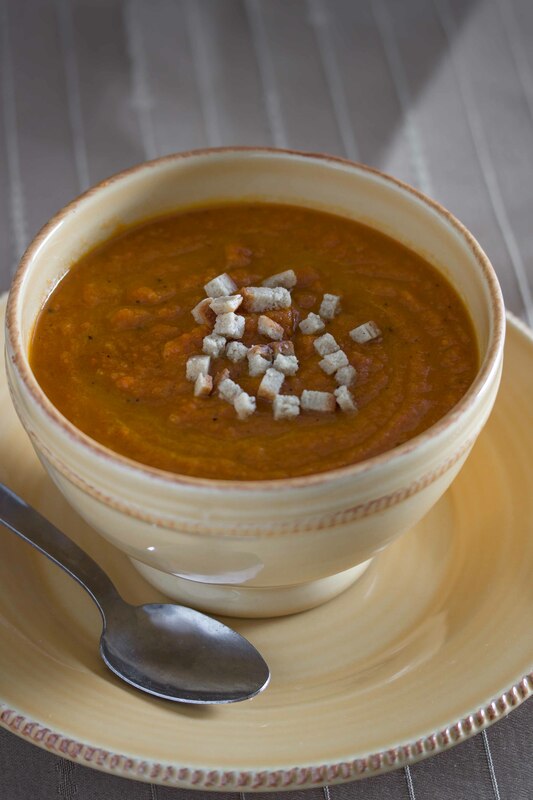 This soup has the most amazing, rich and delicious flavor of carrot and ginger. It’s fall and comfort in a bowl! 4 cups water, plus extra additional to reach desired consistency. Preheat oven to 450. Line a baking sheet with parchment paper. Toss the carrots, onion, ginger, olive oil, honey, salt and pepper on prepared baking sheet. Toss to coat everything evenly. Bake at 450 for 30 minutes, stirring halfway through. Remove vegetables from the oven and place in a large pot. Add the broth and water and bring to a boil over a medium flame. Once boiling, reduce flame to low and simmer for an hour to two hours, until carrots are tender. Remove from heat and allow to cool a bit before blending with an immersion blender, or in batches in a blender. Serve hot. Thanks for stopping by folks! Enjoy the soup! And stay tuned for an exciting announcement! -Miriam PS – do you like my page on Facebook yet? Looks yummy. I have in my freezer a tray of frozen ginger cubes. How many cubes would be needed as a substitute for real ginger? I would use one or two. 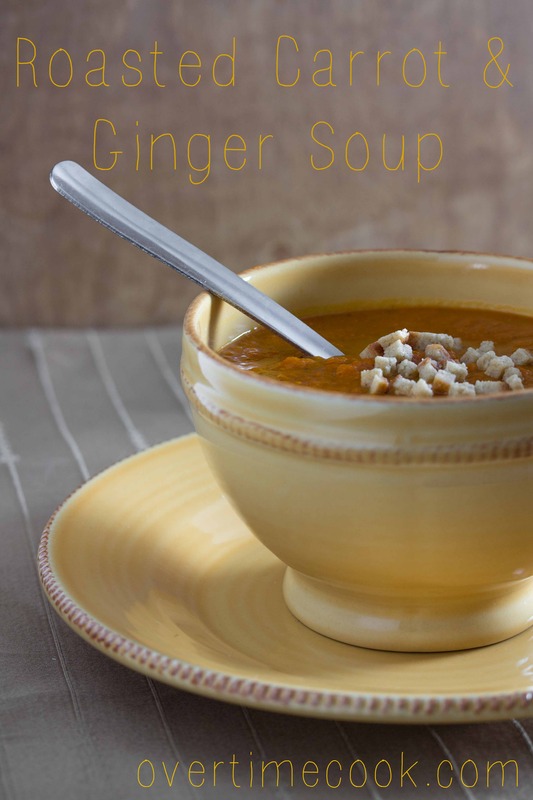 Taste and add another if you want a stronger ginger flavor. 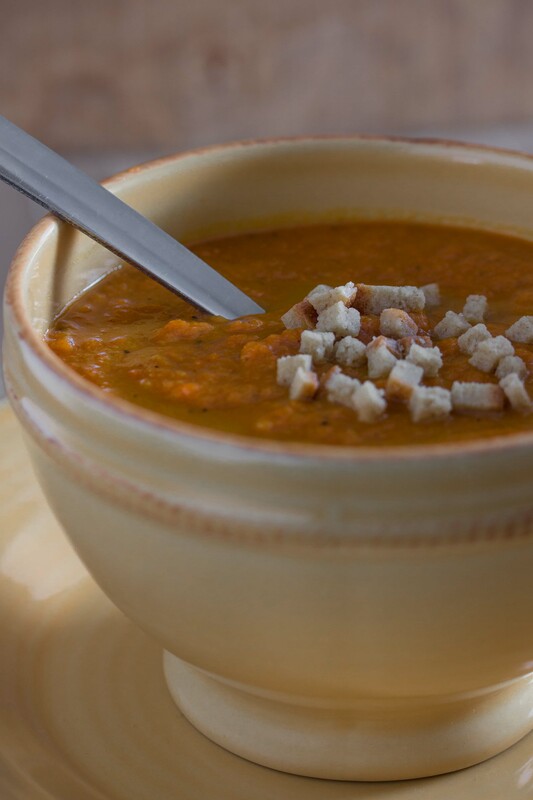 Fantastic looking soup – a classic combo. This would blow any autumnal cobwebs away I’m sure. Looks very good- I will try it out next week when I’m on holiday! i’m excited for soup season, think i’ll make it today 🙂 make my cold go away quicker. mmmmm looks awesome… I will have to try this! i just did a column with roasted zucchini soup and it got rave reviews. roasting emotes the flavor in most veggies… yum! do u have to roast the veges first or can i just sautee in pan? also dont have chicken or vege broth can i use osem? I liked your old layout better, this one is too spread out, and just . . . big. WOW! This looks amazing!! I love carrot & ginger soup. This is a winter must-try! 4 cups chicken or veg broth? Excuse my ignorance but what does that mean? Cups of water with cubes inside? I never understood that in a recipe.. It generally means prepared broth – homemade or from a box. If using cubes – prepare it in water then measure it out. Should I ever cover the pot???? Making it right now. Hence the urgency. Thanks! Absolutely love this soup. Made it.for.rosh hashana 2015. Made this for the first time last night…was so different and soooo delicious! Can I use ground ginger instead? How much? You can, but it won’t be quite the same. I would use a heaping teaspoon, then add more to taste once the soup is completed. I found this site through myfewishlearning.com – this recipe sounds delicious and I will try it. I do have a comment to make about your print function. Normally, when I press the print button, I expect to get the recipe, with possibly a small photo to go with it. In your case, the entire page was printed – with two pages for the recipe , including a very large photo and part of a second. I think that without photos, only 1 page would have been necessary. However, the remainder took up no fewer than 16 pages (!! ), including ads, links to other recipes, more photos, and all the comments. I am quite happy to annotate my printed recipes if I find anything useful in the comments. I hope you will look into this matter, and make the necessary adjustments. I will make the soup soon, despite the above quibble. Next time try copying and pasting the recipe itself. Enjoy! Next time I will do that. However, I still believe that we should get better results when there is a print button. I would suggest to remove the print button and allow the reader to select how much to print. Can I freeze this soup? If so for how long? Yes, you can. I’m not sure how long it’ll last. The usual recommendation for freezing soups like this is 3 months. However I have frozen soups without problem for 6 months or even longer as long as the container’s lid fits snugly, with a little head room to allow for expansion as it freezes.